I read Alice’s Adventures in Wonderland specifically for this project. For me, it belonged to that list of books that every college professor and classmate assumes you’ve read and so you must smile and nod when they talk about them, lest you look like an illiterate buffoon in front of your academic peers. (Other books on this list include, Paradise Lost, The Canterbury Tales, and most of Jane Austen’s work.) Now, having read it, I can see why it has such a fanatic following: it has a staggering amount of depth for such a slim volume. Alice is outside on a lovely day with her older sister, who is generally ignoring her in favor of a rather enthralling book (as an older sister myself, I can tell you that this is something we do). Bored out of her mind, Alice decides to follow a white rabbit in a waistcoat and pocket watch down his rabbit hole. What follows is a trippy adventure wherein Alice changes size by eating and drinking various found snacks of unknown origin, has a tea party with a bunch of crazies, plays a supremely disorganized game of croquet (admittedly, due to the fact that the flamingo she’s using as a mallet refuses to cooperate), and offends a lot of anthropomorphic animals by talking about her cat. I oversimplified it, sure, but it’s also one of those plots you kind of had to be there for. Reverend Charles Lutwidge Dodgson (pen name Lewis Carroll) initially conceived of this story to amuse Alice Liddell and her two sisters during a hot summer boating trip. The three girls were the daughters of Henry Liddell, the vice-chancellor of Oxford University and the dean of Christ Church, where Dodgson taught mathematics. On the surface, this book struck me as a fairly simple fable or parable with an absurd quality meant to amuse children; all the little animals telling Alice how to live her life? Essentially nagging, well meaning adults in disguise. Or Alice’s own mature conscience pressuring her to grow up. However, a little bit of digging into the literary criticism surrounding Alice and I too was tumbling down a proverbial rabbit hole. Fast forward a few hours through Wikipedia citations and my roommate logging me into his university library account so I could chase down essays in academic databases: my brain was spinning with feminist theories, themes of purity and childhood, sexuality, logic (or lack thereof), castration, and mathematics. It’s fascinating stuff, really, but far too complex and varied (or, if you prefer, confusing and contradictory) to detail extensively here. I just skimmed the surface and I’m overwhelmed! With that in mind, I would love to hear any interpretations or analyses from those who have spent more time with the book and have had a chance to really pull it apart. Let me know your thoughts in the comments below! In the book, the Queen of Hearts infamously bakes some tarts, which are stolen and eaten (supposedly) by the Knave of Hearts; it’s the crux of a very climactic legislative proceeding towards the end of the book. That gave me the base idea for what shape this would take: tart. A white chocolate and rose water custard seemed like a fitting way to pay homage to the mistakenly planted white roses of the Queen’s garden, factoring both flavor and color into the choice. To further the aesthetic aspect and continue in the same vein as the Queen’s roses, raspberries provide the red of the flowers after they’re painted, it also compliments the existing flavors. From there it was just a matter of deciding what kind of cookies to use in the crust, and when I couldn’t, I used two! 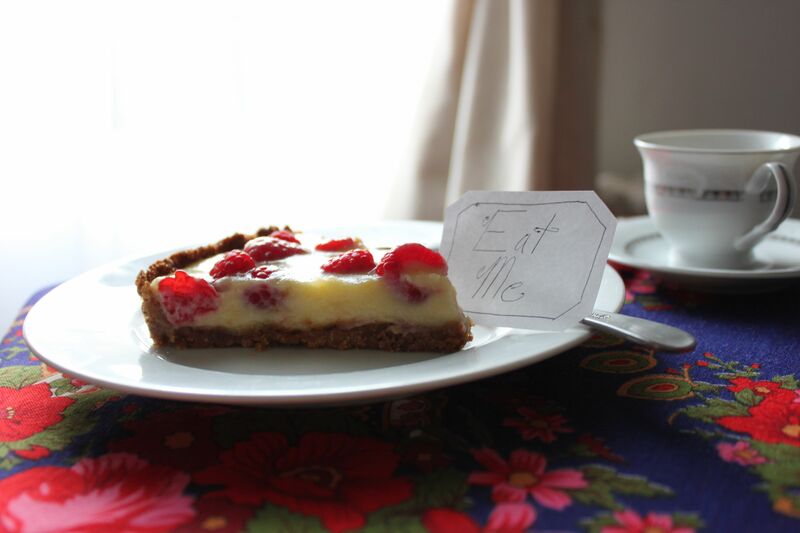 Realistically this recipe should probably be titled “The Queen of Hearts’ Tart,” but our recipes differ – hers is a treacle tart and mine is a bit more floral in flavor – so I felt that would be false advertising. Combine the cookie crumbs, sugar, and melted butter together in a bowl, mixing with your fingers to create a clumpy mixture. You do not want it to be soggy! Press it into the bottom of a tart pan and blind bake for approximately ten minutes or until golden brown. Allow the crust to cool. Pour a tablespoon of water into a small bowl and sprinkle the gelatin evenly over it, allowing it to stand for about ten minutes until the gelatin has softened and absorbed all the liquid. In a saucepan, heat the milk and cream over a medium heat until it begins to simmer. Whisk the eggs, sugar, cornstarch, vanilla, and rose water together in a separate bowl. Slowly, bit by bit, add the egg mixture to the milk/cream still simmering over a low heat, and whisk in until fully incorporated. Add the gelatin, allowing the heat and the whisk to break up the clump until the custard is smooth again. Continue whisking over a medium-low heat for approximately five minutes until the custard thickens. Remove the custard from heat and incorporate the mascarpone and the white chocolate. Wash the raspberries and scatter them evenly along the bottom of the cooled crust. 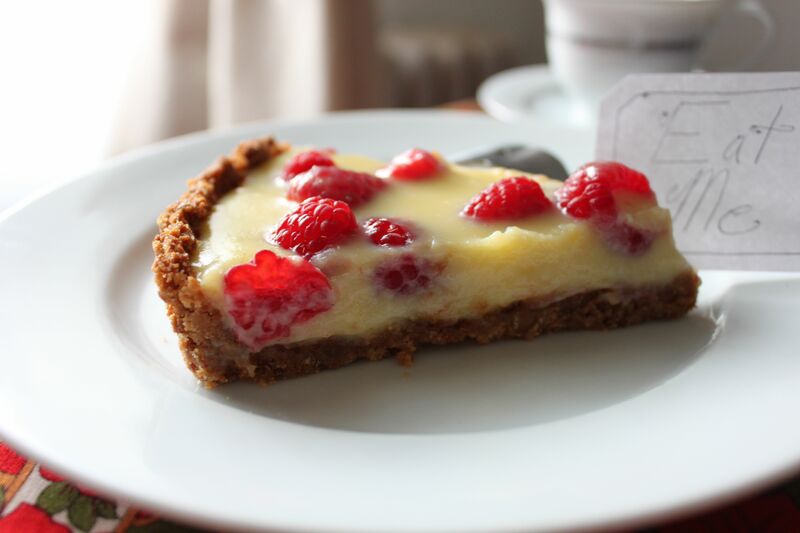 Slowly pour the custard into the crust, allowing it to fill up around the raspberries. Place the tart in the refrigerator for 1 ½ to 2 hours or until the custard has fully set. Serve at your next tea party, preferably where everyone is wearing large hats and telling riddles and generally acting mad. Mad people love tarts, I should know, I attended a major American university for four years. You are hilarious. This post is fantastic. I want to jam (geddit? geddit?) my face in that tart and never emerge.